This is another audience recording that is featured on Beehive Candy as it is something of a collectors item for fans of the band and also because there is a story to go with this performance. 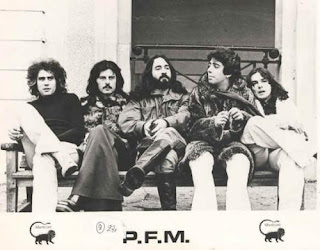 Premiata Forneria Marconi (PFM) (translates - Award-winning Marconi Bakery) were the first Italian group to have notable success abroad, entering both the British and American charts. Between 1973 and 1977 they released five albums with English lyrics. They also had several successful European and American tours. PFM introduced new sounds, such as the synthesizer, to the Italian musical world. They were also among the first to combine symphonic classical and traditional Italian musical influences in a rock music context. Such innovations and their longevity have made them among the most important bands in the international Progressive rock genre. We have received so much great new music these last few weeks it really is proving a job to keep on top of matters. I guess in part it is the time of year however lets rip through the final selection for this month as I do not want to miss any of these songs out! 'Meatman, Piano Tuner, Prostitute' is the first single to be taken from the Vessels' second album Helioscope (due out Feb 2011) and is released on the 8th November. The band features the guest vocals of Stuart Warwick (formerly Jacob's Stories) who will accompany the band on their headline set of dates in November. Before then, Vessels embark on a tour of Europe with Oceansize. The band will be writing a tour diary so keep up to date at the band's website. The new song is just superb and we really want you to check these people out! Remaining tour dates as follows.